The Core Stage Inter-Tank Umbilical being installed at the LETF. Testing of several of the umbilical lines that will attach to NASA’s Space Launch System (SLS) rocket from the tower on the mobile launcher continues at the Launch Equipment Test Facility (LETF) at Kennedy Space Center in Florida. The Core Stage Inter-tank Umbilical (CSITU) arrived at the LETF and was attached to the “C” tower of the Vehicle Motion Simulator 2 test fixture. Engineers with the Ground Systems Development and Operations Program and the Engineering Directorate will prepare the umbilical for a series of tests to confirm it is functioning properly and ready to support the SLS rocket for launch. The tests will begin in January 2017 and are scheduled to be completed by the end of February. Testing will include hydraulic system controller tuning, umbilical plate mate and leak checks, primary and secondary disconnect testing at ambient temperatures, and fire suppression system functional checks. Also, a series of primary and secondary disconnect testing at liquid nitrogen and liquid hydrogen temperatures, minus 321 and minus 421 degrees Fahrenheit, respectively, will be performed. The CSITU is a swing arm umbilical that will connect to the SLS core stage inter-tank. The umbilical’s main function is to vent gaseous hydrogen from the core stage. The arm also provides conditioned air, pressurized gases, and power and data connection to the core stage. The CSITU will be located at about the 140-foot-level on the mobile launcher tower, between the Core Stage liquid hydrogen and liquid oxygen tanks, and will swing away before launch. The umbilical is one of several umbilicals that will be installed on the mobile launcher tower and attach to the SLS rocket and Orion spacecraft. The Orion spacecraft is scheduled to launch in late 2018 atop the SLS rocket on a three-week mission that will take it thousands of miles beyond the moon and back during Exploration Mission 1. 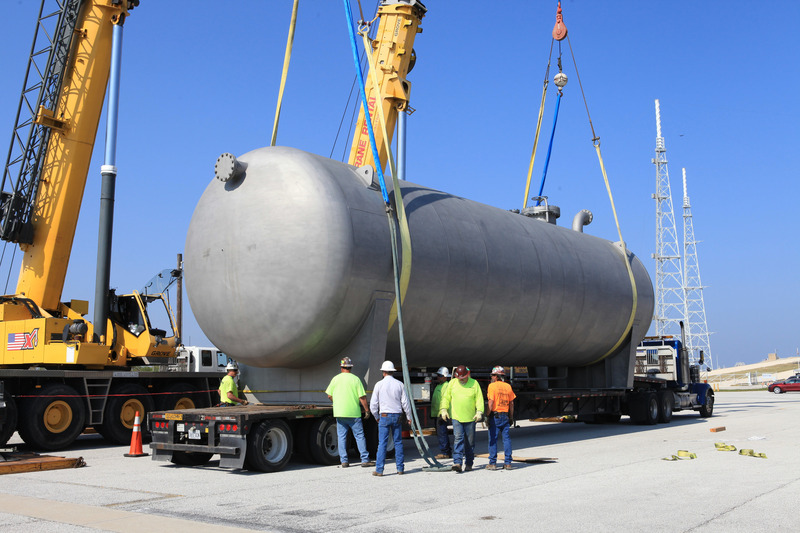 A new liquid hydrogen (LH2) liquid separator tank has arrived at NASA’s Kennedy Space Center in Florida. It will be used to support the agency’s Space Launch System rocket and all future launches from Launch Pad 39B. The tank was lifted by crane, rotated, and then lowered on the transporter for the move to the pad. The existing hydrogen vent system that terminates at a flare stack was designed for gaseous hydrogen. New requirements for Exploration Mission 1 and future launches include the need to address liquid hydrogen in the vent system. The new LH2 separator/storage tank will be added to the existing hydrogen vent system to assure gaseous hydrogen is delivered downstream to the flare stack. At Pad B, the existing hydrogen vent line and supporting systems will be modified to accommodate the new LH2 liquid separator tank. The Ground Systems Development and Operations Program and the Engineering Directorate at Kennedy are performing the upgrades to Launch Pad 39B to support the agency’s premier multi-user spaceport. The 60,000 gallon tank was built by INOXCVA, in Baytown, Texas, a subcontractor to Precision Mechanical Inc. in Cocoa, Florida. It is about 56 feet long, with a 14-foot diameter. The second half of the C-level work platforms, C North, was installed Nov. 10 in High Bay 3 inside the Vehicle Assembly Building (VAB) at NASA’s Kennedy Space Center in Florida. The platform was lifted up by crane from the floor of the transfer aisle and lowered into the high bay for installation on the north wall of the high bay, about 280 feet above the floor. The C platforms are the eighth of 10 levels of platforms that will surround NASA’s Space Launch System rocket and Orion spacecraft and provide access for testing and processing for the uncrewed Exploration Mission 1 flight test and deep space missions, including the journey to Mars. The C platforms will provide access to the Space Launch System’s Multi-Purpose Crew Vehicle Stage Adapter and the Interim Cryogenic Propulsion Stage for mate activities. 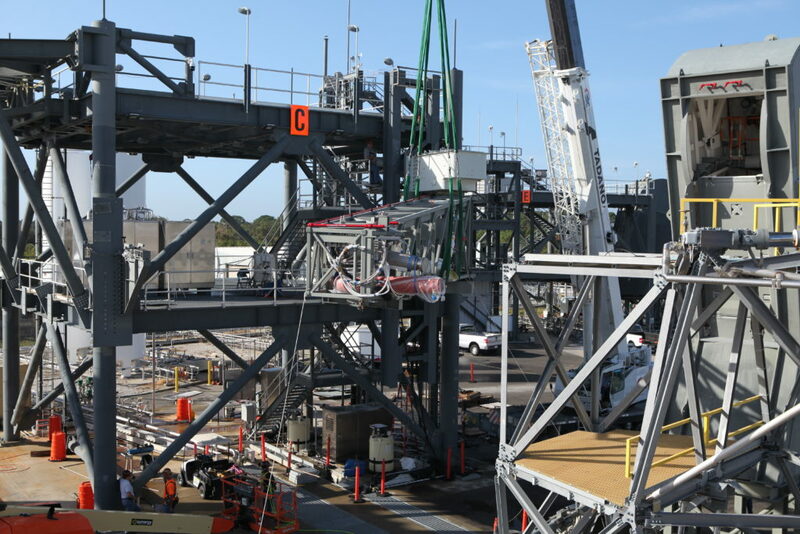 ICPS mate to the Launch Vehicle Stage Adapter (LVSA) operations occur on Platform C. ICPS umbilical mate operations also will be performed on this level. LVSA upper access doors are located on Platform C for entry to the top of the ICPS. The Ground Systems Development and Operations Program is overseeing upgrades and modifications to the VAB, including installation of the new work platforms. The second half of the B-level work platforms, B north, for NASA’s Space Launch System (SLS) rocket, arrived by heavy-load transport truck at the agency’s Kennedy Space Center in Florida on Nov. 7. The B platforms are the ninth of 10 levels of new platforms for High Bay 3 in the Vehicle Assembly Building (VAB). 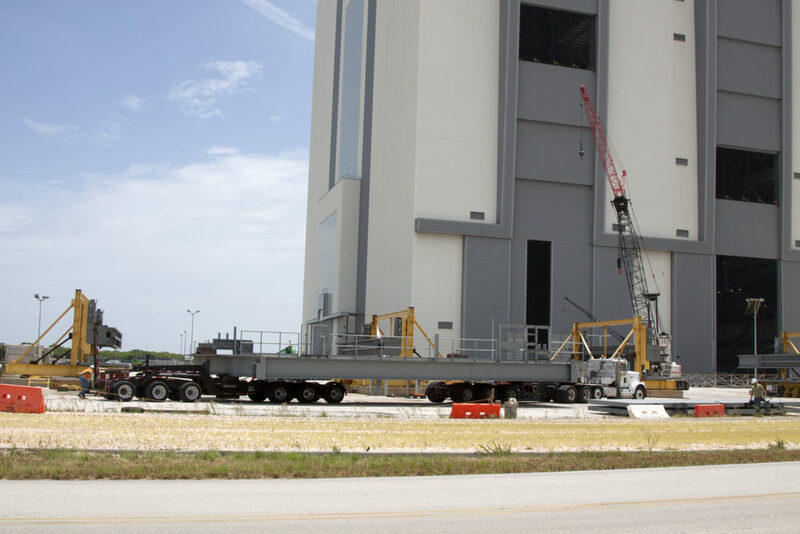 The platform was delivered to the VAB staging area in the west parking lot. A total of 10 levels of new platforms, 20 platform halves altogether, will surround the SLS rocket and Orion spacecraft and provide access for testing and processing in the high bay. The Ground Systems Development and Operations Program is overseeing upgrades and modifications to VAB High Bay 3 to support processing of the SLS and Orion spacecraft for Exploration Mission 1 and deep space missions, including NASA’s Journey to Mars. 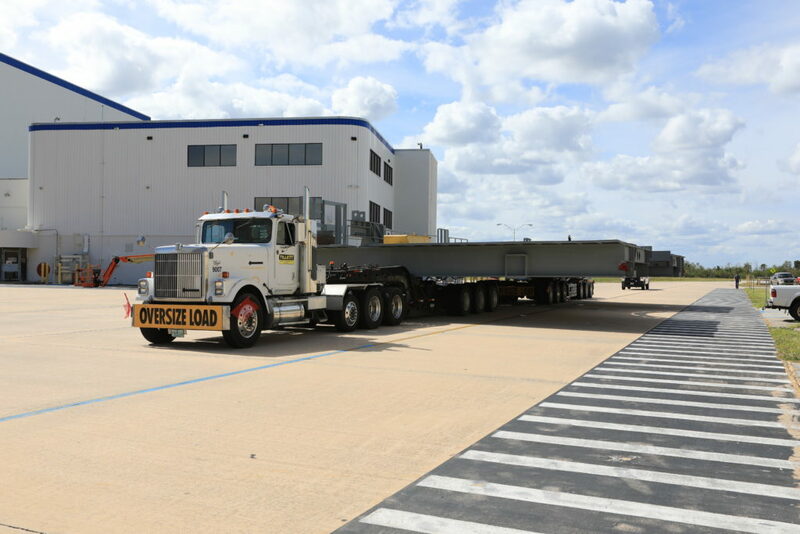 A section of the second half of the C-level platforms, C North, for NASA’s Space Launch System (SLS) rocket, arrived at the agency’s Kennedy Space Center in Florida on Aug. 30. The platform was offloaded from a heavy lift transport truck and secured in a staging area in the west parking lot of the Vehicle Assembly Building (VAB). 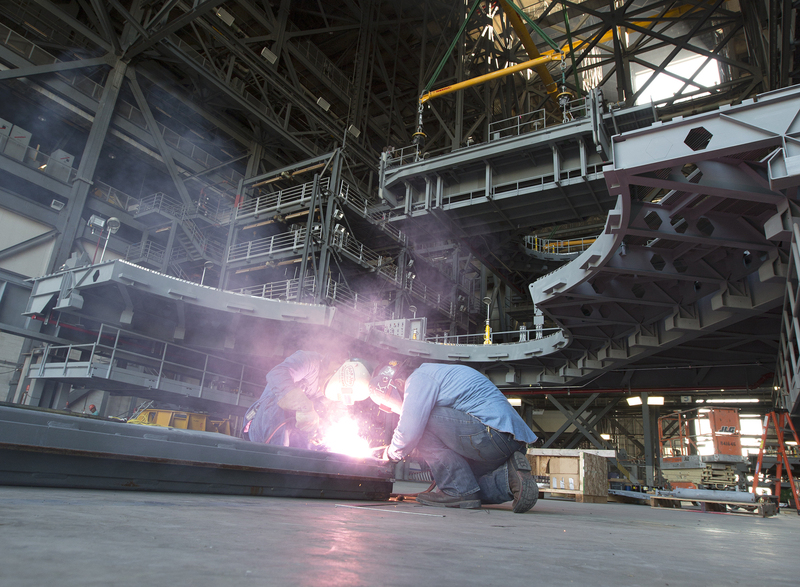 The Ground Systems Development and Operations Program is overseeing upgrades and modifications to VAB High Bay 3 to support processing of the SLS and Orion spacecraft. A total of 10 levels of new platforms, 20 platform halves altogether, will surround the SLS rocket and Orion spacecraft and provide access for testing and processing. The first half of the E-level work platforms, E South, was installed Aug. 26 in High Bay 3 inside the Vehicle Assembly Building (VAB) at NASA’s Kennedy Space Center in Florida. The platform was lifted up by crane from the floor of the transfer aisle and lowered into the high bay for installation about 246 feet above the floor on the south wall of the high bay. The E platforms are the sixth of 10 levels of platforms that will surround NASA’s Space Launch System rocket and Orion spacecraft and provide access for testing and processing for the uncrewed Exploration Mission 1 flight test and deep-space missions, including the journey to Mars. The E platforms will provide access to the SLS core stage forward skirt umbilical for mating operations. The platforms will provide entry into the core stage forward skirt for alignment measurements of the SLS critical navigation components. The first half of the C-level work platforms for NASA’s Space Launch System (SLS), C South, arrived in two segments at the agency’s Kennedy Space Center this week. The first segment arrived Aug. 4, and the second segment arrived today. 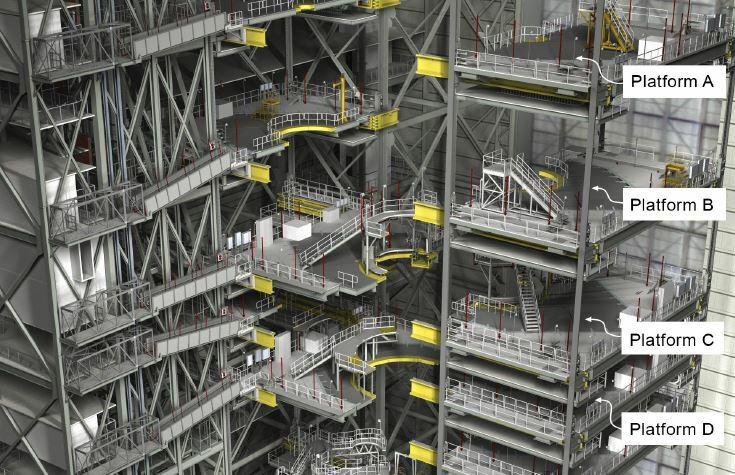 The C work platforms are the eighth of 10 levels of platforms that will surround the SLS rocket and Orion spacecraft in the Vehicle Assembly Building (VAB) and provide access for processing. The platform segments were transported from Sauer Corp. in Orlando, Florida, by Tillett Heavy Haul of Titusville, Florida. Sauer is a subcontractor to VAB general contractor Hensel Phelps. Tillett Heavy Haul is a subcontractor to Sauer. 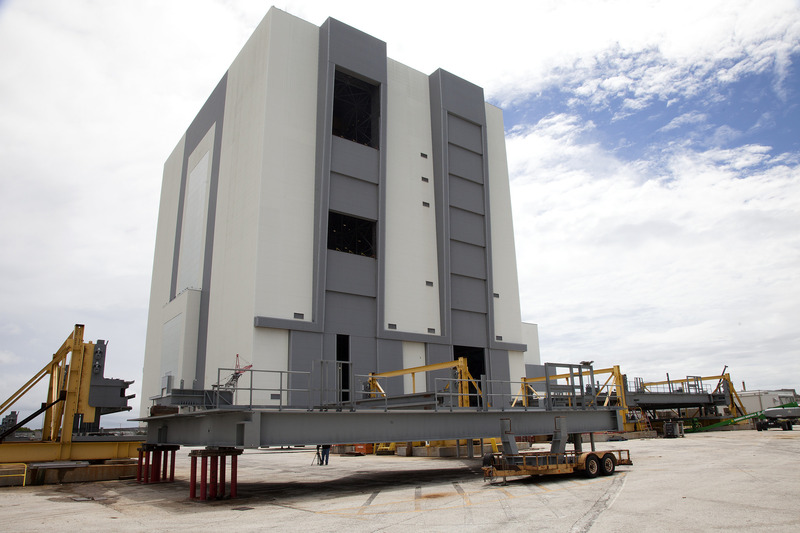 The platform was placed on a stand in a staging area near the VAB, where some final assembly will be performed before it is transferred into the building. The Ground Systems Development and Operations Program is overseeing upgrades and modifications to the VAB, including installation of the new platforms, to prepare for Exploration Mission 1, deep-space missions and the journey to Mars. 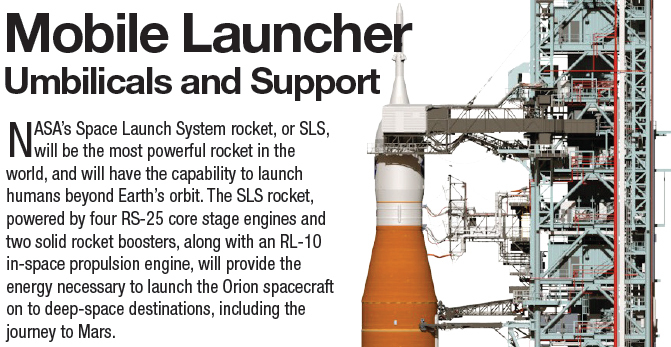 NASA’s Space Launch System (SLS) rocket will be assembled, processed and transported to the launch pad on a mobile launcher featuring a tower equipped with umbilicals connecting power, communications, fuel and other commodities to the vehicle. 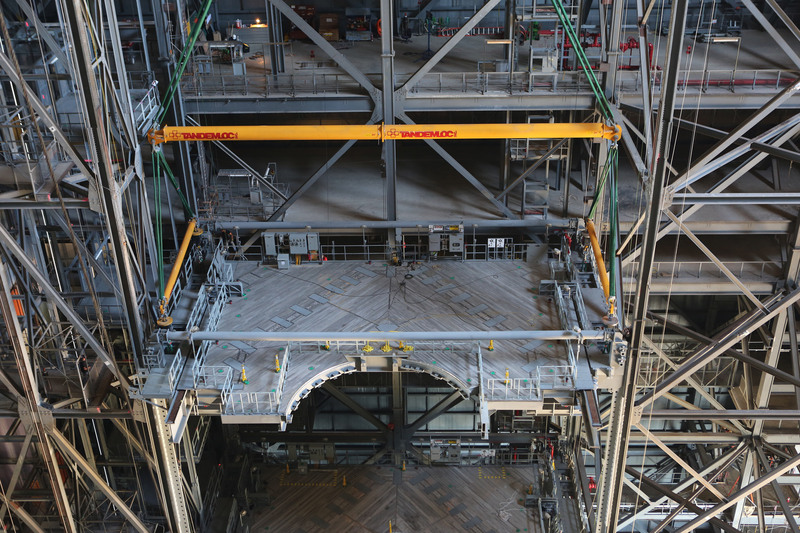 The Vehicle Assembly Building at NASA’s Kennedy Space Center in Florida reached a new level of preparation for the Space Launch System (SLS) rocket and Orion spacecraft. Platform H North was installed Tuesday in the iconic facility’s High Bay 3; its corresponding half, Platform H South, will be lowered into place today. Platform H will allow technicians and engineers to reach the booster for mating of the forward/center segment to the center/center segment, as well as cable routing and booster closeouts. It is the third of 10 levels of work platforms that will surround and provide access to the SLS rocket and Orion spacecraft for Exploration Mission 1. The Ground Systems Development and Operations Program is overseeing upgrades and modifications to VAB High Bay 3, including installation of the new work platforms, to prepare for NASA’s journey to Mars. 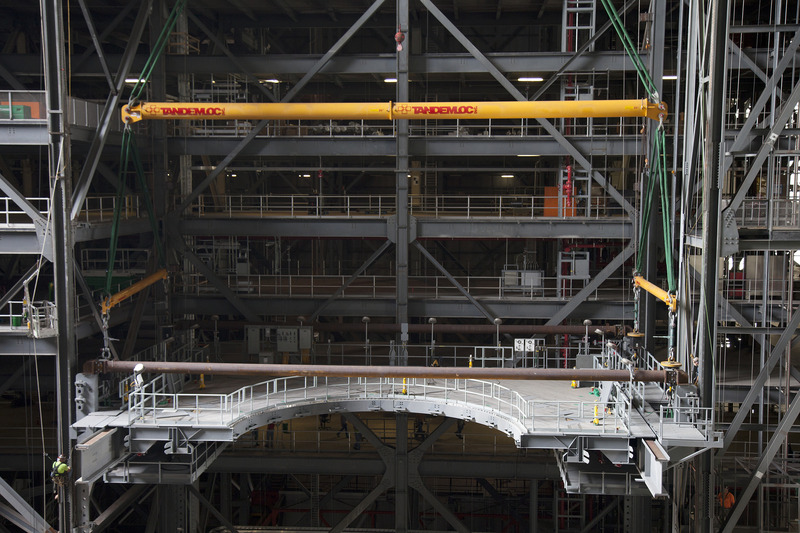 New work platforms being installed in Kennedy Space Center’s Vehicle Assembly Building will provide access for testing and processing NASA’s Space Launch System (SLS) rocket. The rocket will launch an uncrewed Orion spacecraft on Exploration Mission 1 (EM-1) from Launch Pad 39B at the agency’s Kennedy Space Center in Florida. SLS will be capable of launching crewed missions to deep space destinations, including the journey to Mars.